A good starting point is the resort community Hovden on Hwy. 9. Travel on Hwy. E-134 from Oslo or Bergen to the small community Haukeligrend, located east of the mountain crossing. At this point, Hwy. 9 runs south towards Kristiandsand. 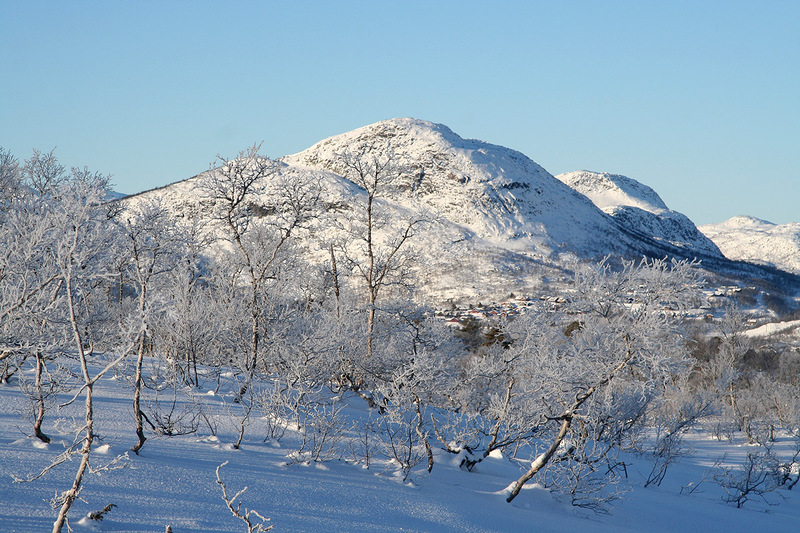 Hovden is about 28 kilometer south. As you enter Hovden, look for a signed (Dagsparkering) parkinglot on the left side (assuming that you arrive from the north). Enter this lot and park, this is the trailhead, location N59:34.580, E007:23.298, elevation about 850 meter. This route runs by the DNT self serve hut Tjørnbrotbu, a convenient base for more exploration of the area. 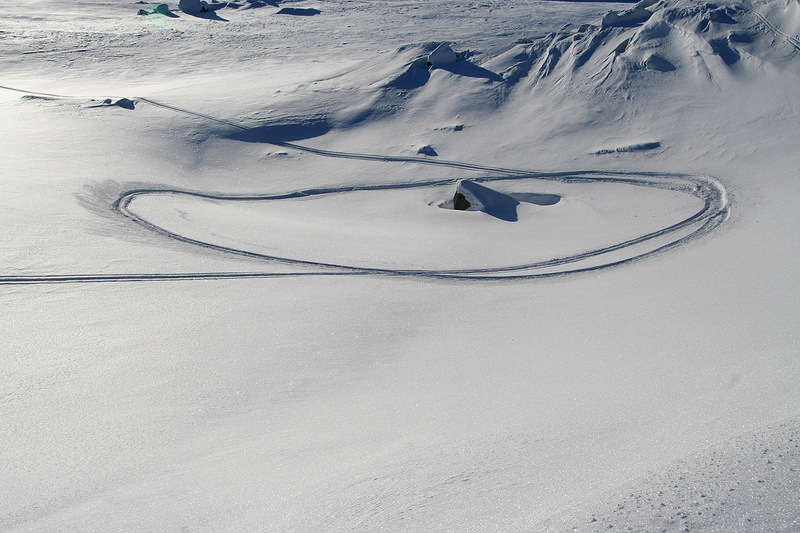 There are quite a few groomed ski tracks that may be used to get near this hut. Exit the parking lot and turn left, following the road that serves huts and apartments further uphill. Do not proceed uphill, but turn right (south) and cross the creek Byrtemannsbekken. You will then locate ski tracks that goes uphill. 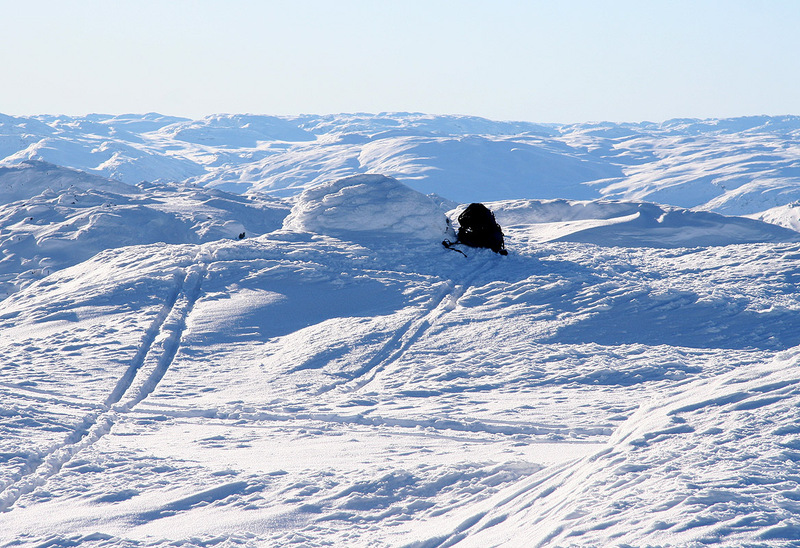 There is a track that runs from Hovden and around the small hill named Nordre Auversvasseggi (elevation 1221 m). 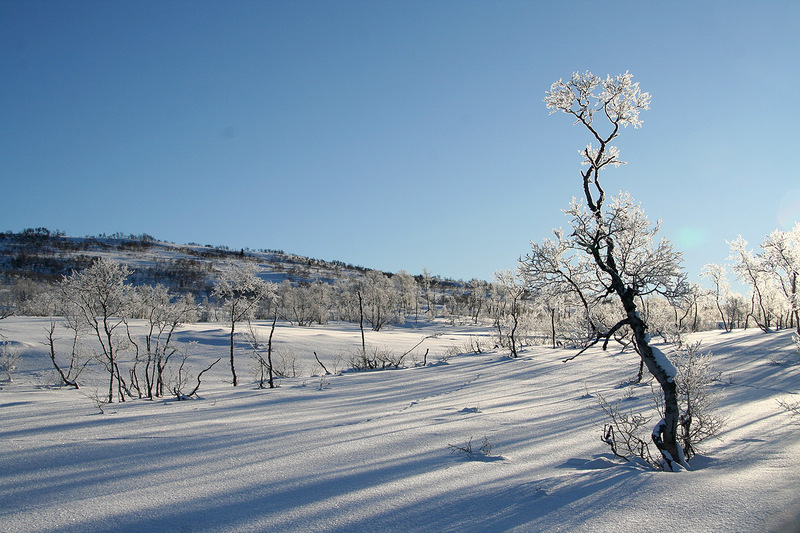 This hill is about 3 kilometer west of Tjørnbrotbu. The most convenient route is to follow the track that climbs on the north side of Auversvasseggi, but the alternative will also work. As you reach the east side of Nordre Auversvasseggi, there is a sign for Tjørnbrotbu, approximately 2 kilometer west. Ascend the gentle slope, gaining approximately 140 vertical meter and cross the crest just north of the small Tjørnebroti (elevation 1316 m). The two huts are then visible below the south slope coming down from point 1448, just north of lake Tjørnebrottjørnane (1280 m). This location is N59:32.228, E007:31.225, elevation 1300 meter. 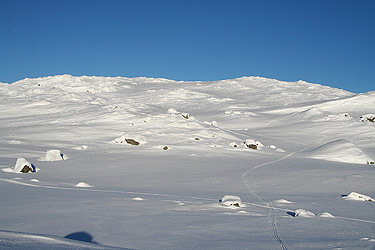 The route (skiing) from Tjørnbrotbu to the summit is perhaps not completely obvious, but the following route should work well. 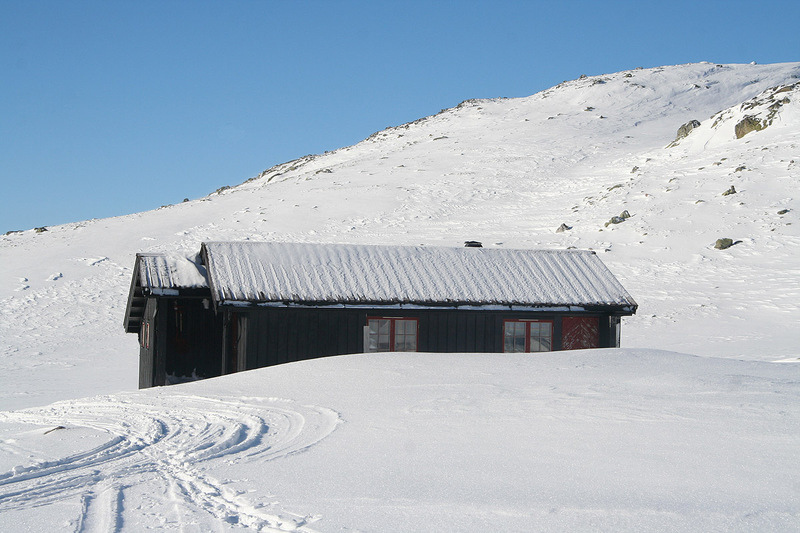 Ski southwest across the flat area below the hut and aim for the outlet where the creek from Gråsteinstjørn (1352m) flows down towards lake 1279. 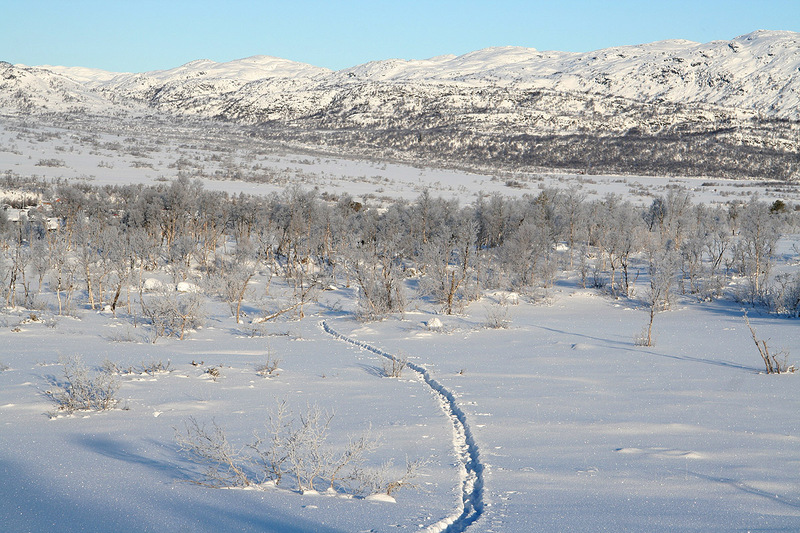 Ski halfway along lake Gråsteinstjørn, then make a left (turn north) and follow the small, but distinct valley that subsequently turns east. Nice skiing, brings you just south of point 1503. Stay on the north side of lake 1405 and climb the slighly steeper, but still very gentle slope immediately east of point 1503. Ski via a distict passage back down to the west end of lake 1421. Cross to the north-east end of this lake and continue north-east. The terrain is smooth and very nice to ski. Ascend the gentle south-west slope in order to reach the top of Kvannefjellet, elevation 1537 meter. 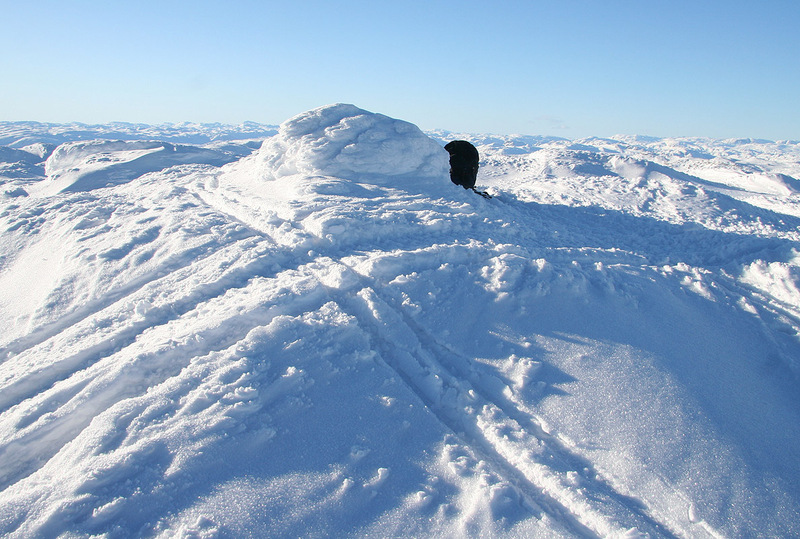 There are two small summits about 30 meter apart. The west summit has a small cairn, while the east summit is a bit more pointed and possibly slightly higher. Comments: I drove from Bergen after work on Friday, leaving around 1700. The ferry at Kvanndal was in a cooperative mode and soon I was negotiating slippery roads near Røldal. I stopped at the DNT hut Haukeliseter in order to break the drive and enjoy a bit of the evening with a couple of beers and good company. 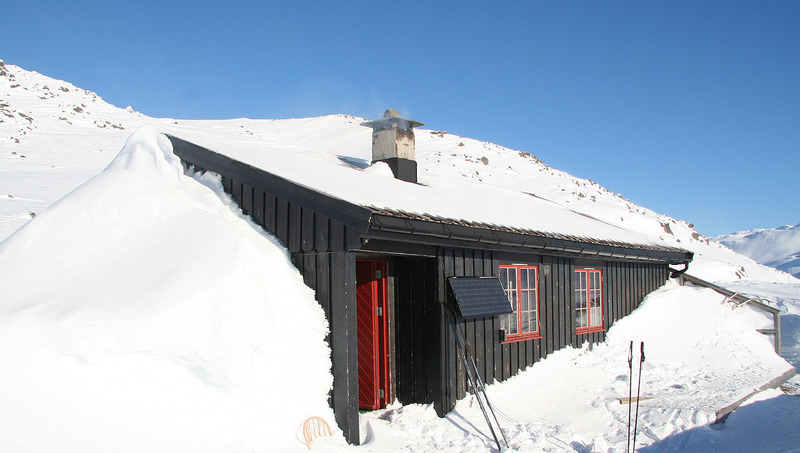 The place was well visited, people signed up for wind surfing classes (using skis), as well as a class from the outdoors study program at the Bø Folkehøyskole. I had breakfast at 0800 and left around 0830 in order to drive to Hovden. 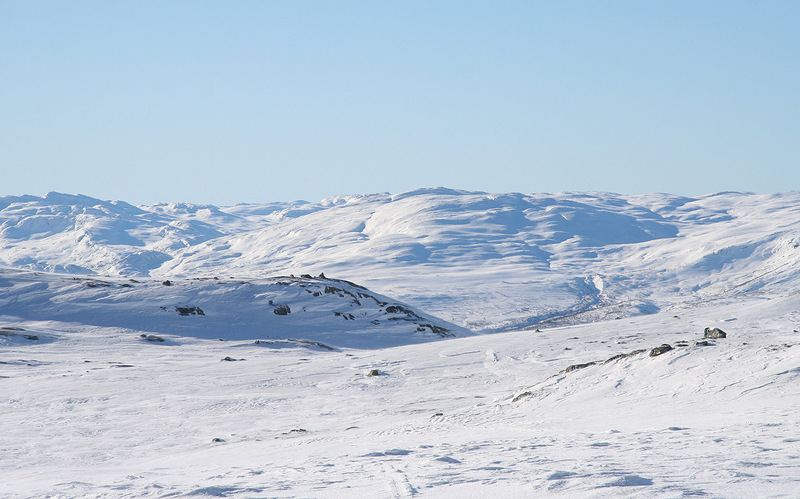 The weather was just gorgeous, blue sky, early sun on some summits and a very, very white landscape. I arrived at Hovden by 0920, the temperature read minus 21 Celcius, quite cold. After a bit of reorganizing, I was ready to leave around 0945. I went up the road among the vacation homes as far as possible, thus missing the beginning of the groomed ski trail system. As I was completely new to this area and since all the huts and apartments looked pretty unoccupied, I just started breaking trail along the gently rising terrain. After a bit of time I came across a big, well prepared ski trail, unfortunately, it went exactly perpendicular to my route. However, shortly thereafter I hit another ski track that had a more promising direction. Quite happy with the track I arrived east of Nordre Auversvasseggi, left the trail and skied up and across the ridgeline to the DNT-hut. The day was just perfect and I seemed to be the only person taking in the great views. The trip had taken me roughly 2.5 hours, including the wasted time when breaking my own ski track in pretty deep snow. 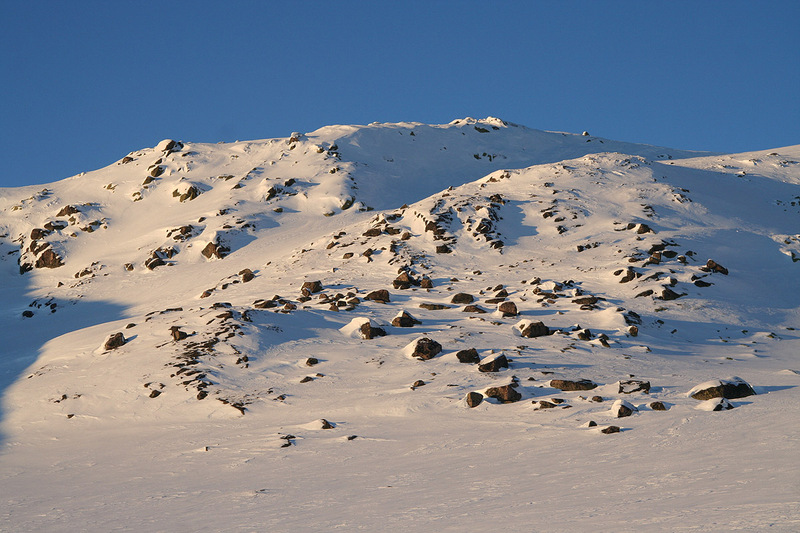 From here, I could see directly across to the Kvannefjellet area, the highest summit being further behind. The hut was open, but from the visitor register nobody had been here since almost 3 weeks ago. After leaving about half the weight (and volume) of my backpack, as well as getting a good fire going in order to warm the hut, I started out for the Kvannefjellet summit around 1315. I found a nice route and had a really good time in pretty rugged terrain, arriving at the summit by 1445. Interesting enough a snow scooter had been at the summit shortly before me. Such driving is illegal in Norway and I have mainly seen violations in Northern Norway. 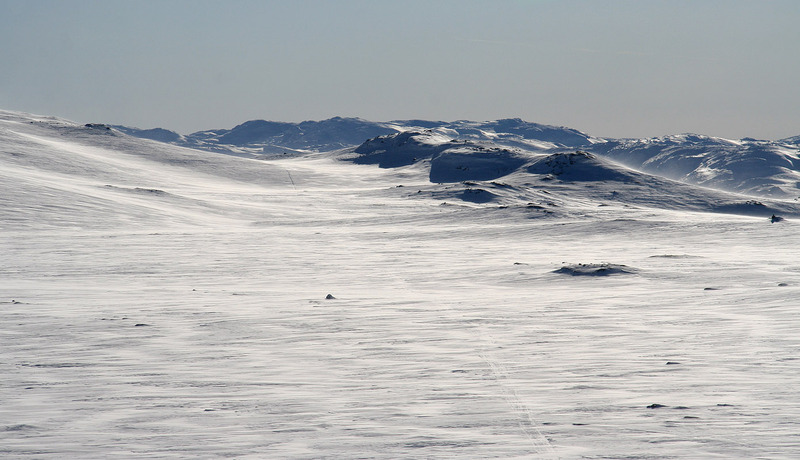 The air was extremely clear and I enjoyed the 360 degree panorama, from the characteristic Hårteigen to the north, the majestic Gausta further east and many more summits that I did not readily identify. I measured the two small summits and tentatively concluded that the cairn is perhaps slightly lower, the margins are small however. I started back home by 1500 and came across more tracks from the snow scooter quite close to my uphill tracks. Tracks that were not there during my ascent, thus this scooter was driving around just at the same time as I was skiing. I was back at the DNT hut shortly before 1600. The fire was still ok and the hut was slowly warming. I prepared spaghetti for dinner with canned peaches for desert. The sun was getting low and the evening light illuminated the nearby hill as well as sending some last glow across to the slopes of Kvannefjellet. I was busy preparing my evening meal while the night was coming with an incredible black sky filled to capacity by stars. Orion and the Big Dipper, and thousands of more, all brilliant with me as the only observer, at least from this location. The day had been close to perfect, slightly more than 20 kilometer of skiing from around 850 meter to an isolated summit, that required route finding, at 1537 meter. 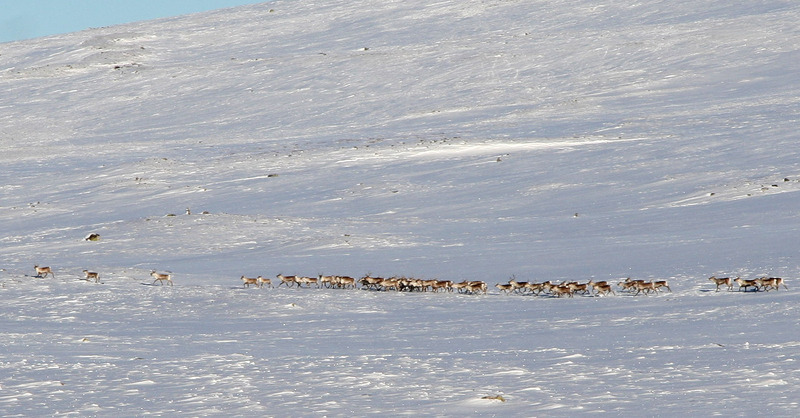 My trip continued the next morning with a long ski trip to Sæbyggjenuten, 1507 m.
Reindeer seen on the way to Tjørnbrotbu.